By December, if the gardening press is to be believed, we have all retreated inside to mugs of tea and seed catalogues, toasting our toes at a roaring fire and eating crumpets. But in fact, given the chance most of us will grab half an hour of dry(ish) bright weather to get out into the garden, pick up the broken twigs and worse, check fences and greenhouse panes, stand pots on clay feet and wrap treasures in fleece against sudden cold snaps. At this point, my favourite plant suddenly comes into its own. 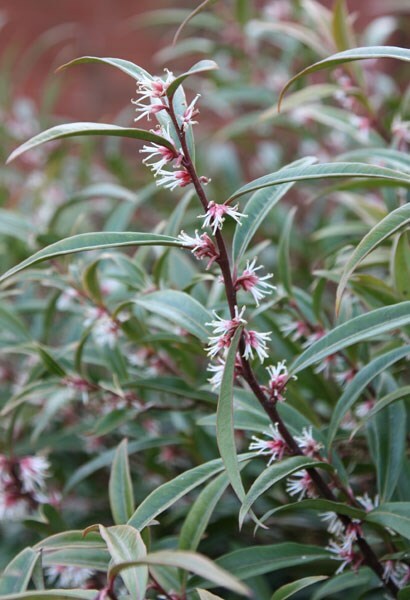 Sarcococca, the Winter Box, is an absolute gem with glossy dark green foliage, intensely scented white flowers, and the obliging habit of growing peacefully in shade and putting on a show when everything around it is over. It comes in a number of varieties which offer different heights, flower and stem colours so there is truly one for every garden, and even a clay pot will act as a home, though do try to make it a decorative pot to set off its beauty. They will act as hedges, dark green anchors in a design, punctuation marks and space fillers, with stems of green or purple and berries of red or black depending on the variety selected. Mine grows just outside the back door, offering wafts of sweet fragrance to passers-by and acting as a backdrop to other flowering plants later in the year. It gets no special treatment and puts up with shade and moisture loss from a nearby oak without complaint. I water it when I remember and trim the ends of its stems back a little if it starts to occupy more space than it should. A few sprigs in a vase will perfume a room and make us believe that spring is closer than perhaps it really is.